Leveraging Smart Technologies for Security & Public Safety (Part 2) | FutureShield Inc. Published Nov 17, 2018 | By Mike Morrow, CEO, CommandWear Systems Inc. Lessons learned when deploying wearable technology with Public Safety and Security Teams. 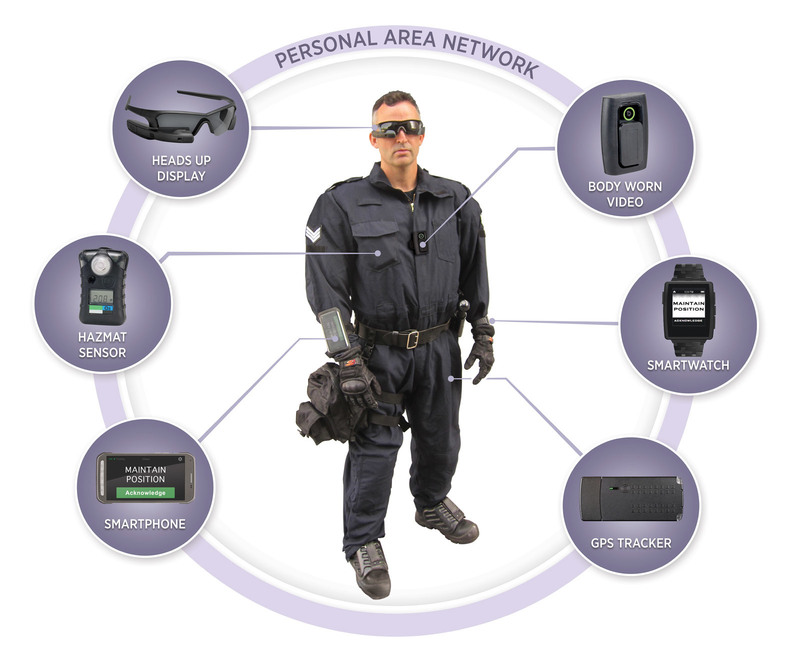 CommandWear has conducted over twenty operational field deployments of wearable technology with various law enforcement, fire/paramedic and corporate safety organizations. We are pleased to share some of the learnings with you. Our approach was to be as hardware agnostic as possible to give users choice; therefore, we stayed away from developing proprietary hardware and instead leverage commercial off-the-shelf devices. The apps have been designed to run on industry standard operating systems that power dozens of smart devices; specifically, Wear OS™ developed by Google and Tizen™ developed by Samsung. Apple Watch™ can also be used but feedback has been that current editions are too expensive and lack ruggedness demanded by the public safety and security market. When looking at implementing wearables, costs are a big factor and not all organizations want to be forced to supply staff with smartphones and data plans. We think the right approach is to offer choice. Those with Android and iPhones simply load an app from the Google Play or Apple Stores onto existing devices they already use. Those who don’t have a phone can just wear a $300-$400 smartwatch and download the Responder Watch app from the Samsung Galaxy Store (this app version runs completely independent of the phone and provides a secure login from the smartwatch). LTE-connected smartwatches, such as Samsung Galaxy Watch™, will require a data plan but most carriers in North America and other parts of the world offer ‘no money down’, low cost monthly data plans over a 2-year term. The smartwatch is one example of a Smart Hub, as is the smartphone. The advantage of these devices is they are becoming ubiquitous … the correct approach is to leverage the devices, networks and systems that organizations already have in place rather than invest in yet another piece of equipment that has to be maintained and hauled around. Frontline responders wore smartwatches from Samsung (Gear S3), Motorola (Moto360), and Huawei (Watch 2). Smartwatches were Bluetooth tethered to an iOS or Android smartphone used for GPS location tracking and communications via LTE and Wi-Fi networks. The smartwatches and smartphones were running the CommandWear mobile situational awareness apps and connected to a secure cloud server. Commander’s in the field used tablets and operations center staff used desktop and laptop PC’s to access the CommandWear web app in order to track locations and status of field staff, view and share pictures/video, securely communicate and replay a historical log of events. CONVENIENCE: Most mobile teams preferred the smartwatch over a smartphone for basic communications, especially those needing to remain hands free and/or covert. COST: Smart devices with Push-to-talk over IP and rich text messaging functions have opportunity to replace expensive radio systems and devices. FirstNet in the USA, and other Public Safety Broadband initiatives, will accelerate this trend. COMMUNICATION: Radio traffic was significantly reduced (up to 50% reduction in transmissions) due to use of text messaging to the smartwatch and GPS tracking via the smartphone app. Sensitive information not suitable for radio broadcast could be directed to specific individuals or groups, as needed. Messages were acknowledged by pushing a button so Command/Ops Centre staff knew the message was received and read. SAFETY: Safety was enhanced through location tracking, panic button and heart rate monitoring and alerting features. Remotely connecting to a responder’s mobile device and starting video/audio streaming was also considered important when a responder had not checked-in and was un-reachable by radio (especially if the heart rate alert was triggered). DECISION SUPPORT: Better decisions could be made by Commanders by knowing exactly where resources were located and viewing picture/video and live video streams from those locations (a force multiplier). RESPONSE: Speed and accuracy of an emergency response was improved through knowing exactly where field personnel were located (e.g. who’s closest and in position; knowing when a perimeter was established). FORM FACTOR: Smartwatches enhance operational effectiveness and safety in police, covert, confined space, and high angle rescue operations. In situations requiring heavy clothing, such as firefighting and public order operations, the watch was placed under the sleeve for GPS tracking and heart rate monitoring/alerting. This was considered useful since phones couldn’t be used. INTEROPERABILITY: A seamless integration of team data was shared across systems, such as dispatch and AVL, through an open Application Programming Interface (API). This gave command and dispatch a “one pane view” of all assets and allowed multiple agencies to work from a common operating picture. DATA SECURITY: A mobile data management (MDM) solution was considered important to enhance security and ease management of apps running on all mobile and wearable devices (e.g. simplifying the software update process; remotely wiping the app and data if the device is stolen or lost; limiting ability to surf the web causing distraction). Technology is advancing very rapidly and there are opportunities to leverage these advances for enhancing situational awareness and ultimately help to protect people. Below are just a few examples and we welcome your ideas and feedback. Artificial Intelligence (AI) – we see several areas that AI can assist. To enable responders and field personnel to operate heads-up and hands-free, without distraction, speech recognition and ‘virtual assistant’ technology can be used. Rather than needing to interact with devices, users simply tell the system what action to take (e.g. send a message) or what they need (who is closest to assist me). A prototype demonstration of using a virtual assistant in an emergency situation can be viewed here: Amazon Alexa ‘Protect my School’ video. External Sensor Integration – real-time data collected from external sensors (IoT devices) should be leveraged when appropriate. For example, atmospheric monitoring sensors detecting dangerous levels of toxic materials shoud automatically trigger alerts to anyone within a defined hazardous zone (geo-fence); it should also notify those who are tasked with ensuring personnel safety. Object Recognition – new facial and object recognition technology can be integrated into mobile apps to provide field teams with a tool to identify persons or objects of interest using smartphone or body-worn cameras. Examples are helping locate a missing person or alerting when a person of interest is spotted. If you are interested in learning more, partnering or just providing your ideas on what’s needed, please contact me at my email below or visit http://www.futureshield.com.